Sri Lankan crab curry in chilli-garlic sauce(thick gravy). Sri Lankan crab curry in chilli-garlic sauce(thick gravy)- a delicious seafood dish, that never disappoints. bring home a few fresh crabs and have a family feast. 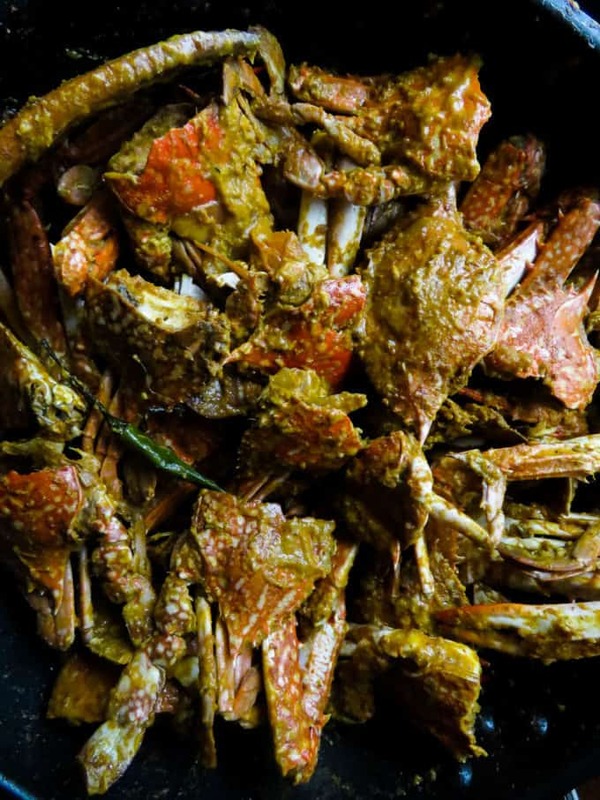 You probably think cooking a delicious crab curry at home is difficult, especially when it comes to cleaning, yes? Well, it’s not, as a matter of fact, it’s easier than any other seafood. Take for example prawns and squid, if you’ve cooked them, you know both of these sea creatures take a few steps to clean. Compared to them, crabs are easy to deal with. 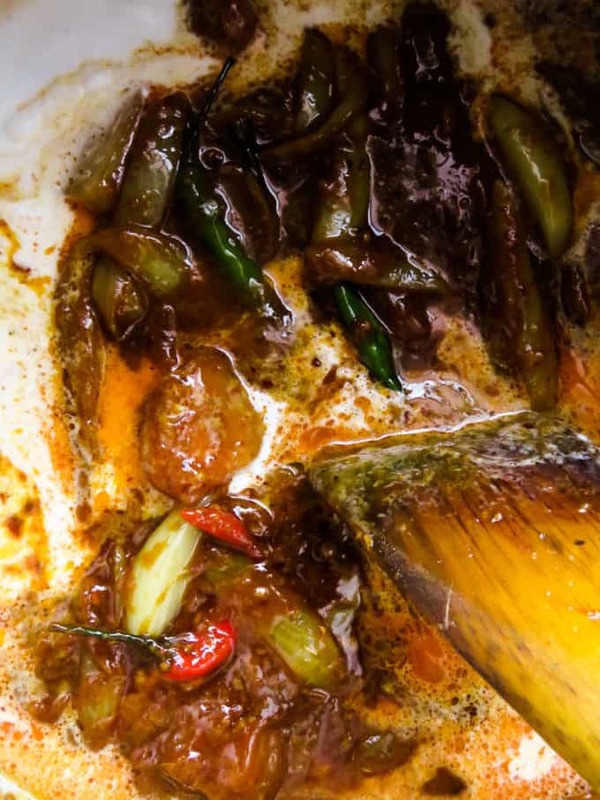 In this chilli crab curry with loads of garlic, I’ll take you through the process of creating a wonderful seafood dish your family is going to enjoy. I love improvising recipes and this is one of those curries I ended up doing with thumbs up from the family. Since they loved it so much, I thought you might like to try it as well. For this chilli crab curry, I’m drawing inspiration from the ever-popular Singaporean chilli crab curry, adding my own Sri Lankan twist to it. As much as I loved the taste of the Singaporean chilli crab curry. I honestly found it to be too spicy to enjoy. Trying to get to the meat of the crab while having to endure the heat of the dish just doesn’t do for me. I do enjoy spicy food but I believe there should be a certain limit to adding heat to a dish IF it hinders the enjoyment of the dish, in my case this rule certainly applies when I cook crab. So I came up with my own dish that has elements of the Singapore hot chilli crab curry while enhancing the curry to be moderately spicy(adjust if the heat as per your need). How I make the chilli-garlic crab curry. After a few tries, I finally found a way to make a thick gravy for the crab curry and it begins with a gravy/ sauce full of flavor. 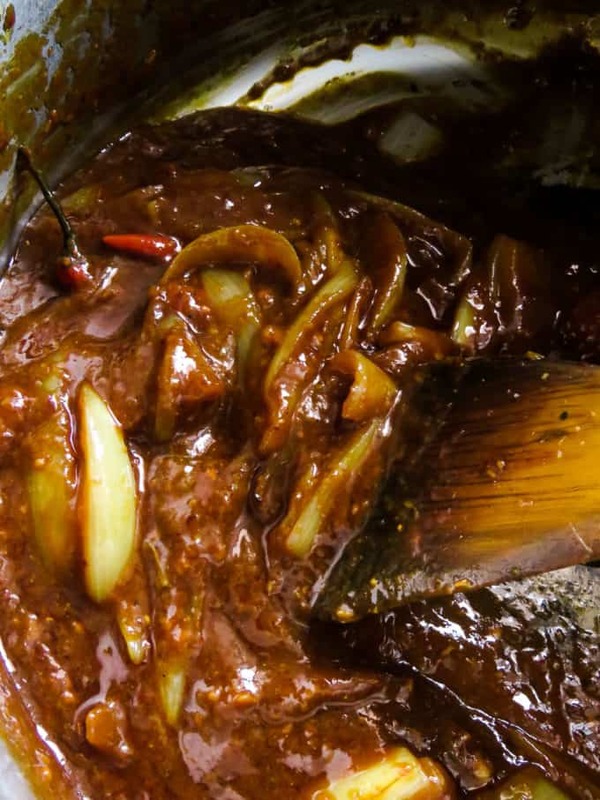 It’s essential that the gravy has all the flavors you want your crab curry to taste. 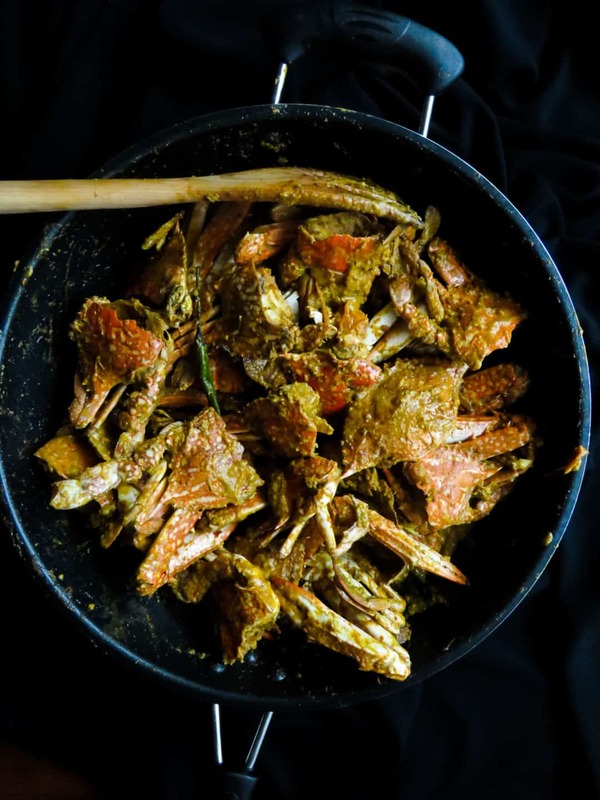 For this chilli-garlic crab curry, I wanted the base to have the taste of ginger-garlic, a bit of sweetness and chilli powder just enough to be spicy but not too spicy that you’ll be spending half of your mealtime, gulping a lime soda or water. 1/ cooking the crabs with a bit of oil and ginger-garlic paste to get rid of any excess water. 1/ If you are cooking crabs for the first time, cook 4-5 crabs first and then move onto a larger quantity. 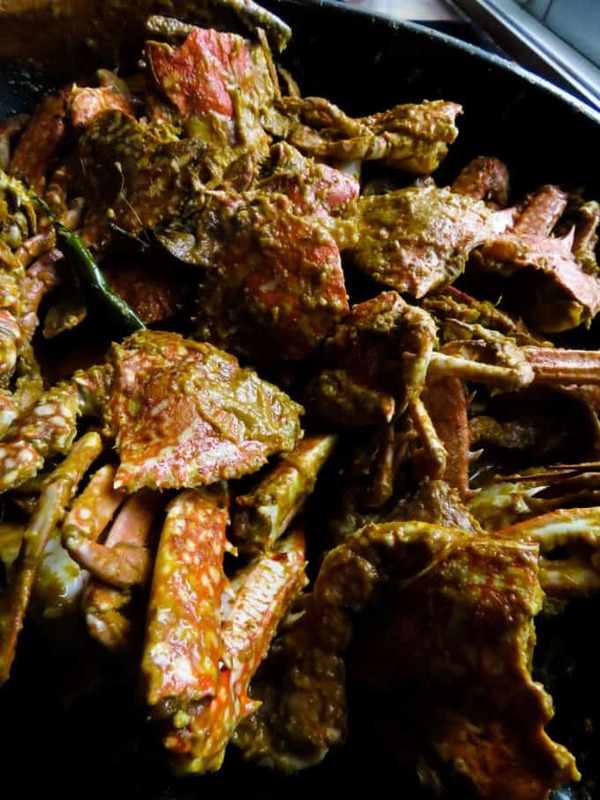 2/ Never cook crabs in a deep stock pot, trust me on this, I once cooked a large quantity of crab for my husband’s friends, he convinced me to make the crab in a stock pot(should have gone with my instinct)and turned out a large platter of tasteless crab curry that his friends were kind enough to eat. 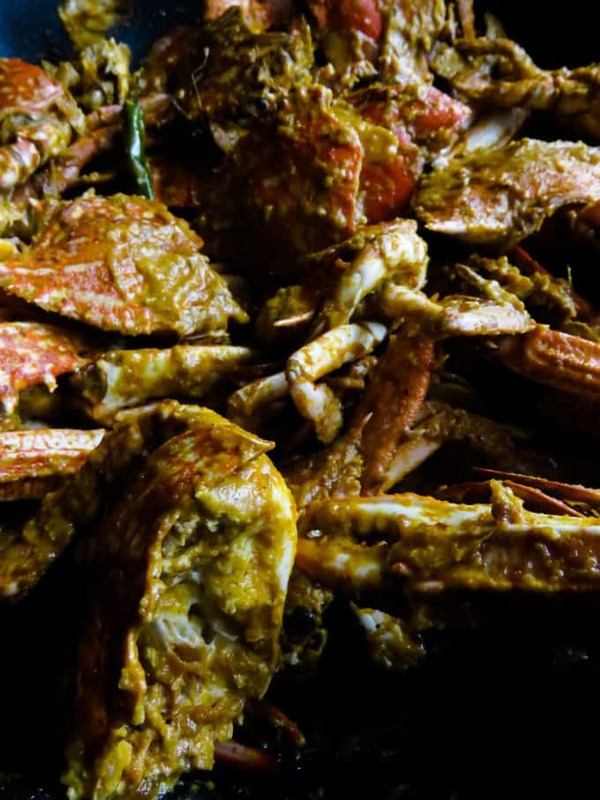 You need to turn over the crabs constantly so that each of the crustaceans gets an opportunity to absorb the flavors, A large wok or a very wide-mouthed pot would be ideal. 3/Not exactly cooking related but if you are cooking crabs for the first time, your first step would be cleaning them. Here’s the thing about cleaning the crabs, everything you touch is going to carry the odor. EVERYTHING. including your hands to your stainless steel sink. You can minimize the odor by washing with turmeric but here are a few things to reduce the clinging fish odor getting into your favorite teacups and plates. clean the crabs close to the sink where you can clean and wash them, this way the odor of the fish can be contained to that area and cleaned quickly. Use an old chopping board to separate the crabs in two. if you are using your daily chopping board, then wash the board with a lime scented washing liquid or rub half of a lime and then wash it with hot water. Spend a few minutes getting the gravy/sauce for the crabs to the right consistency and seasoning. taste, taste, taste. will need to make the hot crab curry. a heavy knife that can separate the crab in two. 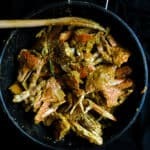 a pan or wok to cook the crab curry. large wooden spoon to mix the gravy with the crabs. Place the prawn in a large pot that would also fit into your sink, add water, 1 and 1/2 teaspoon of turmeric powder, rinse the crabs then drain any excess water. Once drained, turn the crab to expose the belly, you will notice a triangular flap, you won’t need to use a lot of pressure to pry open this flap. place the point of your knife to the triangular point and gently flip it open. Once you’ve opened the flap, using your fingers and running water, clean this part and remove the orange, green substance you see. Separating the crabs in two. Once you’ve cleaned the crabs, place it on a chopping board, belly up, now place the sharp side of the knife on the crab lengthwise. With your free hand over the blunt side of the knife, press down separating the crab in two. Clean the insides of the crab thoroughly again, removing any residues left, you can do another turmeric rinse if you want to. Once washed, drain the crabs of any excess water. (a few seconds of rinsing would do). 1st step- shallow frying the crabs and removing excess water in the crab. Place a large pan over medium heat, pour in 2 tablespoons of oil. Once the oil heats, add 2 tablespoons of ginger garlic paste. sauté for a few minutes(3 minutes)then add the rinsed crabs into the pan. Over medium heat, gently toss the crabs. As the crabs cook, they will release water, use this liquid to boil the crabs,10-12 minutes. 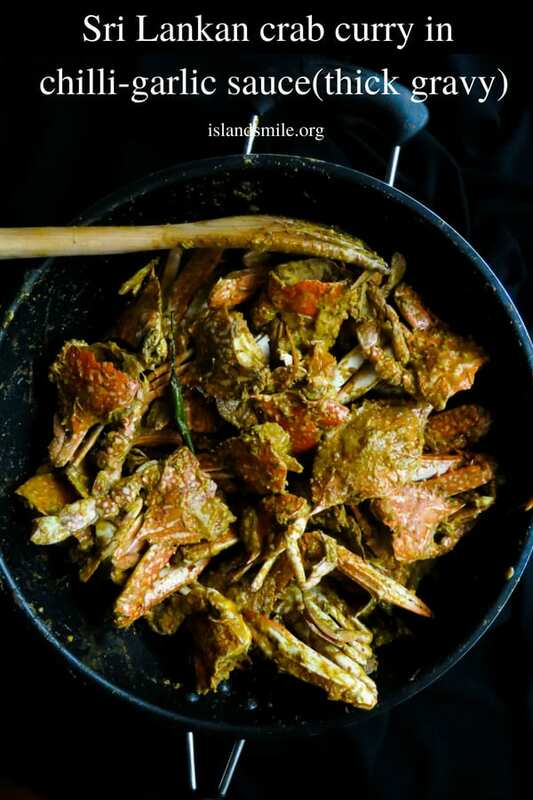 Once the crabs change color and turn orange, remove the pan from heat and set aside or transfer the crab with any leftover crab stock into a large bowl and use the same pan. Cooking the gravy/ sauce for the crab curry. Place pan over medium heat and pour in the oil. Heat the oil for a few seconds and add the ginger-garlic paste, sauté for a few minutes. Add sliced onions, tomatoes, cinnamon and sauté ingredients for a few minutes until onions become translucent and the tomatoes a soft mush. 3-5 minutes. Continue sautéing the ingredients until you have a thick paste. add in the chillies(red or green), followed by turmeric and chilli powder. Constantly stir the ingredients in the wok so the ingredients don’t burn. Pour in the soya sauce followed by tomato sauce(not tomato paste). optional ingredient- at this stage I like to add 1-2 tablespoon of honey or sugar, to elevate the gravy, the sweetener doesn’t necessarily add sweetness but adds another element of flavor that I like in my gravy. adding the optional ingredient is totally up to you but I recommend following this step. Once you’ve made your thick sauce add in the thick coconut milk(see above image). stir the ingredients and season with salt. Add in more chilli powder if you want the gravy to be spicy. taste and adjust other seasonings to your taste buds. Let the gravy slow simmer for 7 minutes or until it thickens. Add the crab(you can add any remaining liquid as well)to the gravy, reduce, cover and simmer the crab curry for 5 minutes. Remove lid, use two wooden spoons to bring up the crabs on the bottom to the top, giving each crab time to cook and coat with gravy. mix the crab curry a few times while it cooks. 15 minutes or until there is less gravy. By this time you will also notice most of the smaller claws detaching, this is normal. once cooked serve warm. Caramelized garlic prawn stir-fry(20 minutes). Spicy black pepper dry prawn curry. Deep fried hot butter calamari.